In many respects, Western Massachusetts is a different world from Boston and its environs. In the rural towns of Berkshire, Hampshire, Hampden, and Franklin Counties researchers can easily depart from the paved road in pursuit of a cemetery or family farm. Looking at the area via the satellite view on maps.google.com, Western Massachusetts appears to be mostly green forest, probably much of it rugged terrain, except for the major towns. The history of the western part of the state reveals two patterns of settlement. The English early traveled north up the Connecticut River, past the falls above Windsor, and founded Springfield in 1636. 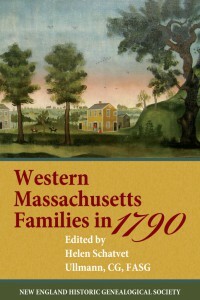 Compared to Eastern Massachusetts, settlement occurred slowly: Northampton was formed in 1654, Hadley in 1659, Hatfield in 1670, and Deerfield in 1673. Even Westfield, on a tributary of the Connecticut River, was not settled until 1660. Areas at higher elevations on both sides of the river, and especially in the Berkshires, were not populated until well into the next century. Not until 1753 did the district of Southampton become the first to split from Northampton, and only in 1763 did Wilbraham become the first town to separate from Springfield. Hampshire County, incorporated in 1662, included the entire colony west of the Worcester area to the ill-defined New York boundary. Having traversed the western forests and mountains during the French and Indian Wars, former soldiers found attractive possibilities west of the Connecticut River. Pittsfield was formed in 1761, the year Berkshire County was finally created from Hampshire. Franklin and Hampden Counties were not separated from Hampshire until 1811 and 1812. Adapted from the introduction to Western Massachusetts Families in 1790. If anyone has a copy of this book I would be very interested in knowing if SKINNER is mentioned, and especially Jonathan and Jerusha (Merrill) Skinner or Joseph Skinner. Jonathan was prominent in Partridgefield/Dalton/Hinsdale from about 1790-1800. He helped establish Hinsdale, and they were early members of the Dalton Cong. Church.